Read from November 26 to December 07, 2014. This book was given to me as a gift and it is a book that I wouldn’t have normally picked up as I don’t have any learning disorders (that I’m aware of). 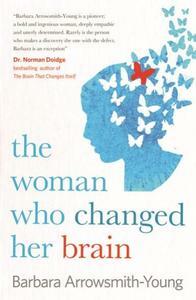 However, this book is inspirational for anyone that underestimates the power of their own brains and is proof that we are more capable of rewiring our brains to change our thoughts and even behaviors. Barbara struggled immensely for most of her life due to severe learning disabilities. She could not understand complicated conversations as she couldn’t make basic associations as well as not being able to understand basic math or reading. Additionally she is severely uncoordinated and accident prone which also relates to her learning disabilities. However, she is blessed with a remarkable memory and can retain vast amounts of information which is what helps get her through many years of school. After 26 years of struggles Barbara comes across some work done on a brain damaged solider who has managed to partially recover from his injuries, as well as some additional information on how a brain can be changed. Through her research and schooling Barbara began to create exercises for herself in order to get the parts of her brain functioning properly. After an extensive amount of training Barbara started to notice improvements in things that use to be a massive challenge for her. Her own improvements lead her to start a school to help other learning disabled people. The book goes into detail about Barbara’s personal story and improvements as well many of her student’s personal success stories. She also goes into details with how specific learning disabilities effect people and what is going on in their brains. Unfortunately, she doesn’t go into too many specifics about the exercises that bring about these remarkable changes but I suppose she can’t reveal her program in a book or her school wouldn’t be successful. With that being said, her work is so immensely important that it really should be revealed so that more people can start applying her tactics. Barbara shows that learning disabilities are so common and that they can cause life long devastation’s. So many of those affected think that they’re stupid but really it’s that their brains are missing specific connections and, like any muscle, just needs to be worked on. I was so remarkably impressed with the success stories in this book. It makes me believe that I am capable of accomplishing anything in terms of changing my behaviors. As someone who has had mental health issues, I know that the symptoms are sometimes very difficult to deal, I can however choose I am going to deal with them and I can work towards rewiring some of my current behaviors. I think there is so much we don’t know about the capabilities of our own brains and this book gives me hope that we can make massive improvements in terms of mental health and learning disabilities.